17/09/2013 - The Slovak Republic has become the 27th member of the OECD Development Assistance Committee (DAC), the leading international forum for bilateral providers of development co-operation. 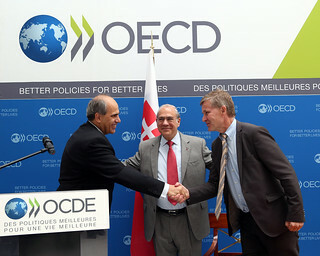 Peter Burian, State Secretary of the Slovak Republic’s Ministry of Foreign and European Affairs, Angel Gurría, OECD Secretary-General and DAC Chair Erik Solheim. Slovakia’s accession to the DAC comes after a period of rapid expansion in its development activities, notably growth of official development assistance (ODA) from $28 million to $92 million over the 2004-08 period. Its bilateral assistance is concentrated in the Balkans and Eastern Europe, as well as in several low-income countries including Kenya, South Sudan and Afghanistan. Projects and programmes focus on building democratic institutions and a market economy, as well as on promoting social, economic and infrastructure development. The Slovak Republic’s multilateral assistance is mainly channelled through the European Union. The Slovak Republic is the third OECD member to join the DAC in 2013, following the accession of Iceland on 14 March and the Czech Republic on 14 May. “Our goal is that all OECD countries, present and future, will become DAC members,” said OECD Secretary-General Angel Gurría. “We will support this process in any way we can,” Mr Gurria said during Slovakia’s accession ceremony. Media enquiries should be directed to Michael Laird, senior policy analyst in the OECD’s Development Co-operation Directorate (Michael.Laird@oecd.org, +33 1 4524 9033) or the OECD Media Office (news.contact@oecd.org, +33 1 4524 7970).